FRC’s new programmable MaxVision LED tank display delivers accurate and instant tank volume. 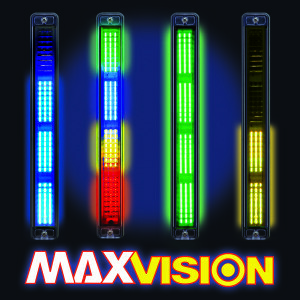 The MaxVision’s multicolor, high intensity LEDs provide a long distance, wide angle view. The MaxVision has built in LED drivers and a photo sensor that adjust brightness for day or night operations. The LEDs are programmable for 6 modes of display. Please see the detailed information for both versions of the NEW TankVision Pro models on their respective product pages: WLA300 and WLA400 as well as for the new MaxVision. The FRC TankVision tank volume indicator has always been recognized for industry leading dependability and unmatched accuracy. Building upon this reputation, FRC is proud to announce the release of the TankVision Pro; the fire industry’s first programmable multicolor tank level display. The TankVision Pro not only offers the same reliable performance as its predecessor, but also innovative features such programmable brightness control that automatically adjusts for day/night use, automatic electric valve control, and a datalink for effective communication with multiple FRC remote indicators. Please see the detailed information for both versions of the NEW TankVision Pro models WLA300 and WLA400 on their respective product pages. John McLoughlin and Brian Roherich worked to put together this great installation overview for FRC’s new TurboFoam Direct Injection Foam Proportioning System. This video in no way replaces the installation manual, but it does cover the basics of installation. This is not a sales or operations video! You will not learn how to operate the TurboFoam system here. It describes the steps a truck builder needs to perform to install the new foam system. The audience for this video is District engineers and mechanics, OEM engineering staff, and technically minded folk who want to understand the components of the TurboFoam system.